• Present ID upon purchasing over-the-counter and upon entering the show venue. Lucky concert goers will be invited to the intimate dinner reception for Ms. Sachiko Miyashita at 7 pm, June 21, at the Trattoria Poggio Antico, BGC. To qualify, purchaser must email ipavinc@gmail.com mobile number and ticket number. 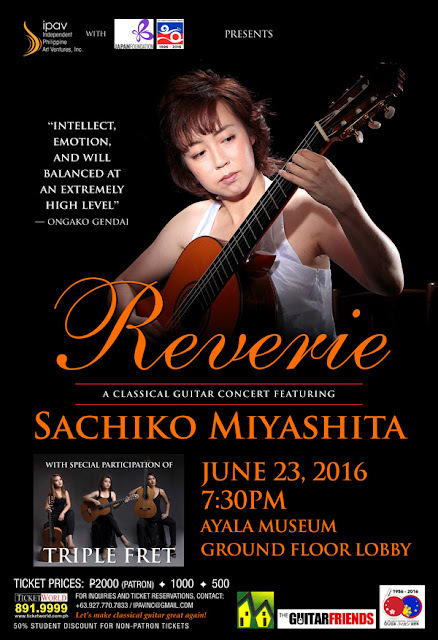 Independent Philippine Art Ventures, Inc.
Reverie, with Sachiko Miyashita, intellect. emotion, tenderness and the trailblazing, globe-trotting all-Filipina guitar trio Triple Fret, together in a rare concert. "INTELLECT, EMOTION, AND WILL BALANCED AT AN EXTREMELY HIGH LEVEL"